There are times we need to translate whole Word document into different language and then send it to a recipient. While there is manual way of using online translation services like Google Translate. You will need to paste contents in online editor, translate text and then paste back translated content in Word document. This will take lot of time and Word document will lose all its formatting. Related – How to say ‘I Love You’ in different languages ? 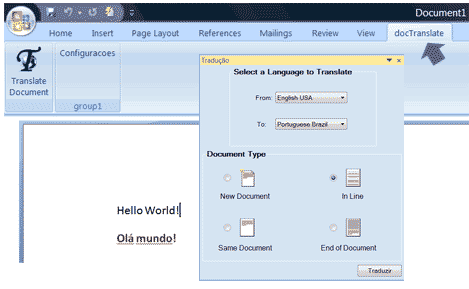 There is an easy way to perform translation of Word documents within Office 2007 without losing formatting and cool by using DocTranslate Office 2007 addon. After install, you will get new tab ‘DocTranslate’ in Office 2007. With document opened in Office 2007, click on doctranslate tab to open translational settings pop-up window. Select the ‘from’ – ‘to’ languages and document type among: new, inline, same, end of document. This addon uses Windows Live translator to perform translation (so live internet connection is required). Download DocTranslate add-on for Office 2007 to perform language translation in a clean and hassle free manner. There is a great online tool which does this using the Google translate API. It translates word documents, excel sheets, and powerpoint presentations while maintaining the document’s original layout.